Includes everything you need for your Gender Reveal party. 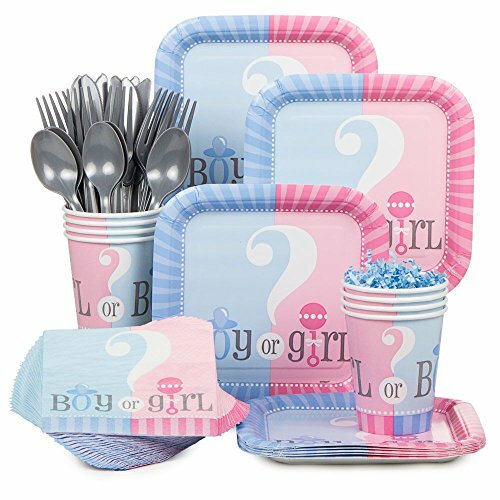 Includes 20 Gender Reveal Cake Plates, 24 Gender Reveal Beverage Napkins, 24 Gender Reveal 9oz Cups, and 18 Piece Silver Plastic Cutlery Set. Features a pink and blue pacifier and rattle design, and words “Boy or Girl?”. Your guests will love this colorful pink and blue partyware set! Dimensions: Cups: Holds 9 oz., Plates: 6 7/8″, Napkins: 10″ x 10″, Cutlery: 6.5″ Long.